There are few things in a marriage that are more a test of compatibility than a couple's ability to navigate a difficult DIY project. While Wendy and I tend to make a very good team and we have years of experience tackling two person projects that might test the mettle of many couples. This doesn't mean we don't occasionally have a situation that can cause one or both of us to pretty much lose our cool. Historically speaking this has happened in one way or another at several times during our journey as DIYers. Typically it's one sided, where one of us loses it and the other is there to simply witness the meltdown and help the other cope. For example, when we learned the back of our house in Old Town was nearly falling down, I was the cooler head to Wendy's explosion. But when I broke a piece of original glass for our transom as I was reinstalling it, after carefully caring for the glass for three years, Wendy was the yin to my firehouse of anger yang. But in the scenario I'm covering today, there was no balance/counter balance, no calm voice to cope with rage. It was a one sided see-saw of furiousness. 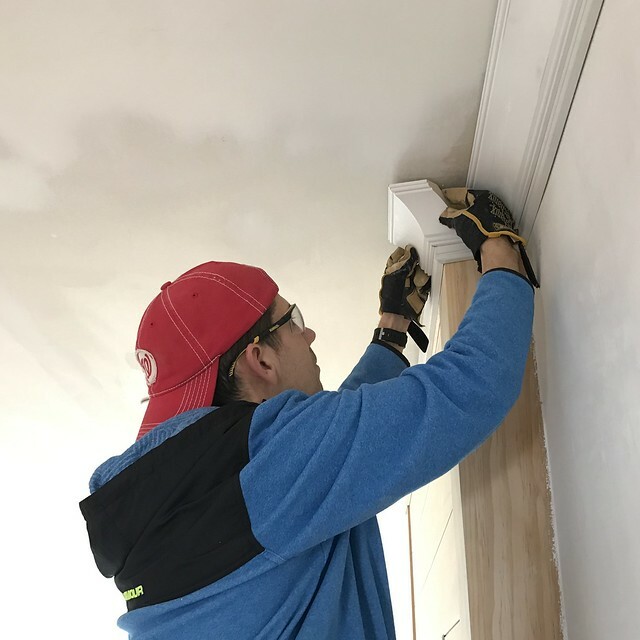 And this all occurred when we decided to try a new approach to something we've been doing the traditional way for years, installing crown moulding. 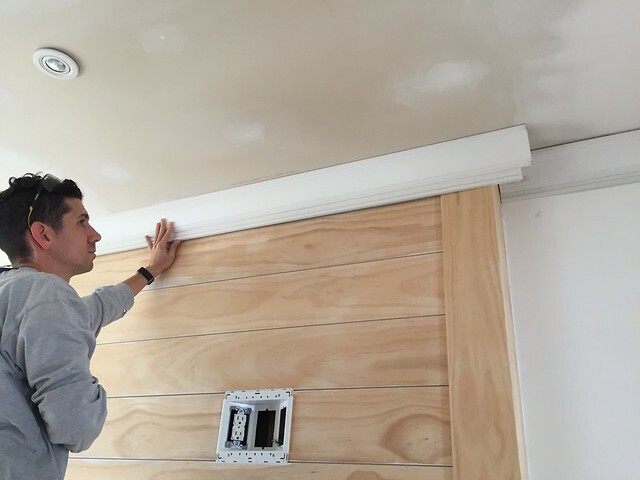 It all came to a head while working in the living room of the water house after we decided on a two-part crown moulding to give a slightly beefier look to the crown detail. We...or at least I decided that the two-part approach of a flat backer against the wall and an upper traditional cove would be substantial enough to balance the other moulding in the room without looking too weak or too overwhelming. With this approach we would be able to use a more simple design for the cove portion of the crown, and a backer that could borrow a bead detail from the rest of the moulding in the room, making everything look cohesive and natural. While I was completely sold on the idea, Wendy...not so much. After months of repeating why I felt this was necessary, I slowly "convinced" her of our need for the two-part crown. Here's a photo that should give you an idea of what I was working towards. 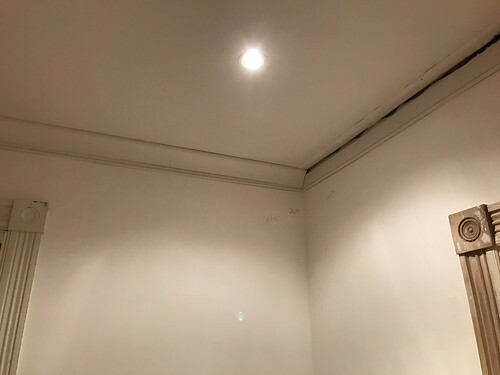 Ultimately, the backer would allow the top of the main crown to sit further from the wall, disguising the line left on the ceiling from where we removed the old crown that was larger. 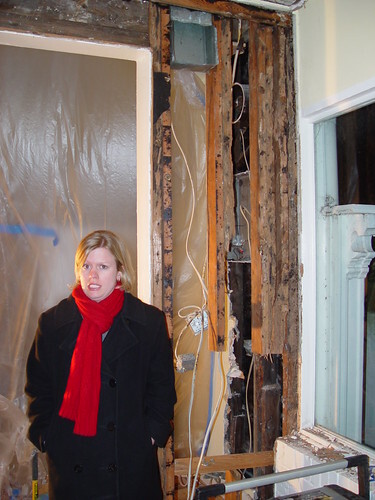 But for me, the real benefit was the backer's ability to help bridge the gaps on the wavy wall. The backer would soften the waves in the wall, keeping the gaps we'd need to fill with caulk a little smaller. We'd essentially "split the difference" on any big gaps, giving us a less treacherous gap to fill. In turn, it would all look more natural and less wonky. But the difficulty here is that this room is huge, and we've never done a two-part crown install. It was certainly a two person job given the many 13' lengths we'd need to hang, which meant one of us would end up standing around and holding things when necessary while the other person stood there staring at the wall and trying to figure out just WTF was going on. 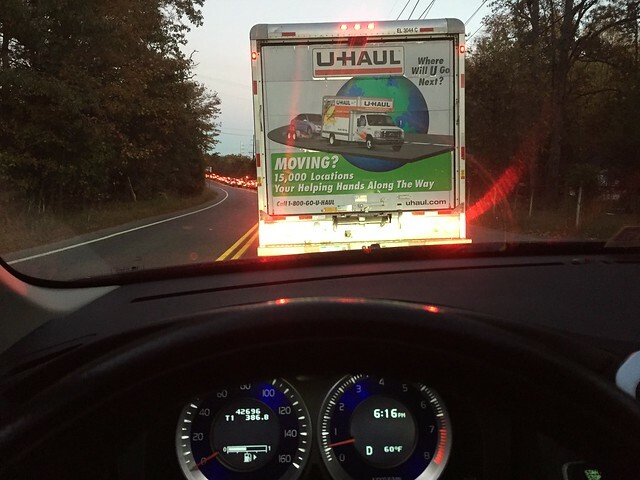 It all started rather innocently with the rental of a U-Haul one Friday afternoon. 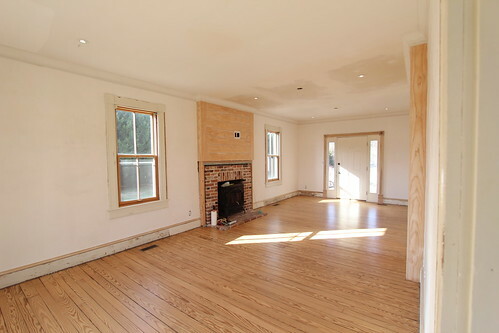 Since this room is rather sizable we'd need full 16' lengths to avoid any unsightly seams. We picked up a 20' truck and headed to the lumber yard to purchase all of the crown and backer we'd need. To kill two birds with one stone we actually bought enough crown and backer to ultimately do every room in our new home's first floor. In case you're wondering, yes, we've found it's far more affordable to rent a U-Haul to transport large loads like this than it is to pay for delivery. However, It does take more of our time, and tends to add to our stress, which may have been the first domino in our path to conflict. And when we accidentally make the trip coincide with rush hour, it makes us hate ourselves. When we got down to the task at hand I was already a bit on edge. I'd convinced Wendy this was the way to do the crown, but now I was doubting my decision and I was starting to worry I'd made a terrible mistake. I always do this after I've already bought the moulding, and I rely on Wendy to reassure me. But Wendy wasn't 100% sold on the idea, so there was little reassurance to be found. So needless to say, we both went into the project feeling a little uneasy. 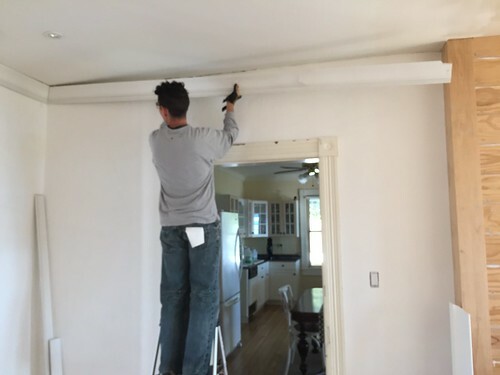 Our first step in install involved determining the reveal of the backer and how we wanted it to look all the way around the room. I held up a few pieces to get an idea of our goal. Even though it was late (and dark), we had no time to waste. After figuring out the reveal we quickly got to work that first night cutting the first piece of backer and hanging it on the wall, then the second. Before we knew it we were ready to put the third backer piece. We shot a time lapse video that night that does a good job capturing just how much waiting around there is while each individual piece is cut, and trimmed, and re-trimmed to ensure a good fit. The timelapse should give you an idea of just how much sitting around and planning there was in our approach. It should also give you a good indication of how we didn't have sufficient ladders for this job. It seems someone (okay it was me) forgot to put the ladder in the U-Haul when packing up all of our stuff. But the install was underway and we had a few pieces of backer on the wall. That's when I realized something...it wasn't going to end up looking very good if we were installing this way. The ceiling isn't perfectly level and if we hung all of the backer first the reveal would be all over the place when we hung the crown, which would look horrible. Rather than continue around the room with the backer we started installing the cove to see how we lined up. 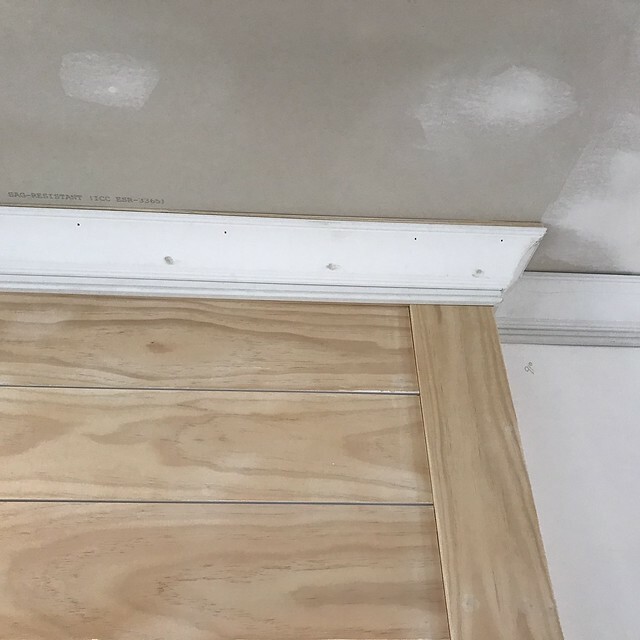 As you can see from the photo, we opted to cope the corners instead of trying to miter all of the inside corners. 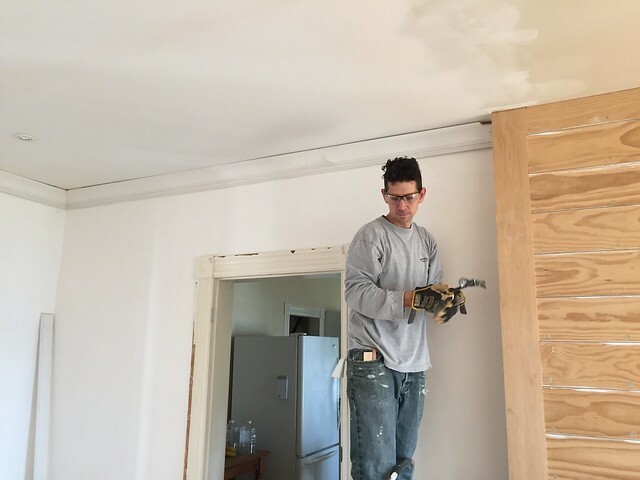 This certainly made the cuts a little easier, especially since the walls and ceiling aren't really level or plumb. But, coping does certainly require more work with the jigsaw to really get the corners looking good. Well, after we hung the first two pieces we immediately started to see some problems. The ceiling dropped down toward the corner of the room and ended up pushing the crown down on the backer. The result is something we looked at and thought, "Well, that's terrible!" The reveal on the backer looked pinched. So we decided to call it a night and pick back up in the morning. Knowing there was this initial issue we got an early start the next day. We had our concerns but I kept looking for reassurance from Wendy...which was wavering at best. Then it happened. Both on edge we hung the third piece of crown on the third piece of backer. While still on the step stool I looked down at Wendy and said "Okay, how does this one look?" I was looking for an assessment of whether the reveal was consistent, but Wendy's response sounded as if it was being applied to the project as a whole. "Honestly? It looks like sh*t." As a DIYer, I was crushed. My dejection manifested in a raised voice, and yelling I replied "I'm asking how this one piece looks, not the whole thing!! Do you want me to rip it all down? Should we forget the backer that we've already bought?!" The tension in the room had quickly escalated from simply uncomfortable to much anger and yelling. But really, we were both confused at the other's reaction. I just wanted an opinion of this one piece and felt I'd gotten a judgement on everything. Wendy was just giving her opinion on this one piece and I was flying off the handle for no apparent reason. One thing we could agree on at that moment, we both sort of had an intense hatred for the other, but we were unable to take a timeout as we were in mid project. As a couple of almost 22 years, communication is one of our strong suits. This is also why a breakdown in communication is met with such surprise. Rather than continue the yelling, I climbed down from the stool, looked back over my shoulder at the third piece of crown already nailed to the wall, and immediately saw what Wendy was talking about. It did indeed look like sh*t. The reveal was huge on one side and tiny on the other. The ceiling was wreaking havoc on the lines and it looked like we'd been installing drunk. There was only one option, we had to rip it down and start over. More importantly, I realized I'd been sort of an arse in my reaction because, well, she was 100% right. The only real option at this juncture was to rip down what we'd put up. Wendy was angrily taking pictures (hence the blur), and I was angrily removing the crown and backer from the wall. I soon calmed my idiot demeanor, took a deep breath, and slowly removed all of the nails while attempting to avoid damage to the plaster. 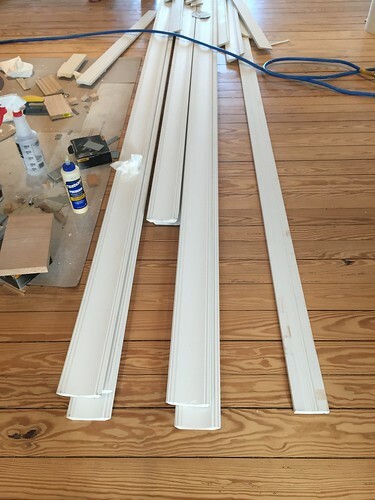 We took stock of the situation, prepared the moulding to be hung again, and figured out where we'd gone wrong. I also tried my best to avoid the death glare that kept following me around the room. It was not particularly successful when it came to this. I continued to struggle with exactly how I wanted to hang this piece of moulding, and my own internal frustration resulted in an outward impatience. 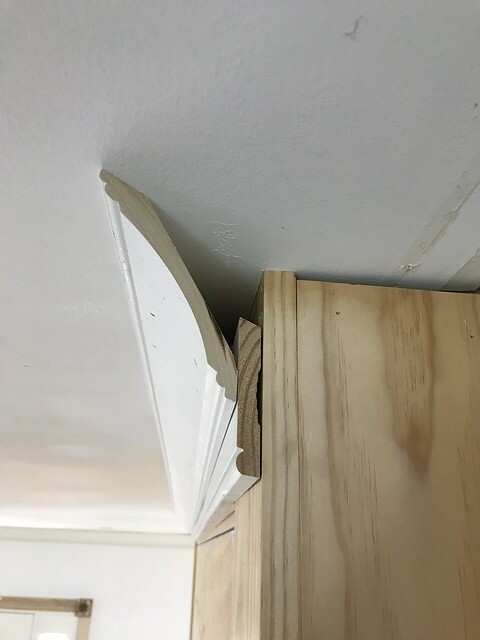 I nailed one side of the moulding in place, moved to the other side, and while holding the molding above my head I lost my temper again at the moulding. Have you ever been in the middle of a DIY project and just wanted to burn the whole thing down? Well, that's about how I was feeling at that moment. I was beyond frustrated and was struggling to see the positive in anything. Nothing was working the way I wanted, and I was beside myself. Wendy, also still seething, couldn't take me any longer and left the room. 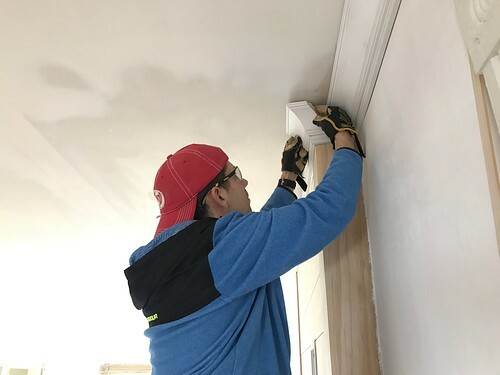 The problem was that one side of the moulding had been nailed, I was holding the other side above my head, and I had no nail gun within reach. So I waited, and waited, and waited. I waited 10 minutes for Wendy to return. My arms were trembling by the time she could stomach the sight of me, and I cooly, calmly, (or what I felt was cooly and calmly given my state of mind) asked her to "please hand me the nail gun." I was able to force the moulding into place and fire a few nails. (In her defense, when she went outside for some air and a break from the me, she didn't realize I was inside holding the molding up without any options.) It seemed this new idea of nailing either side and then handling the middle would work much better. We both then took a break, took a few breaths, and regrouped, putting our...frustrations behind us. Once we had things figured out we had a much better approach and much better time. Rather than nail the whole backer in place, we figure out the correct height for the far ends by using some smaller scrap pieces of crown. After nailing the two ends, we'd then be able to hold the whole larger piece of cove in place and ensure the reveal was where we wanted. 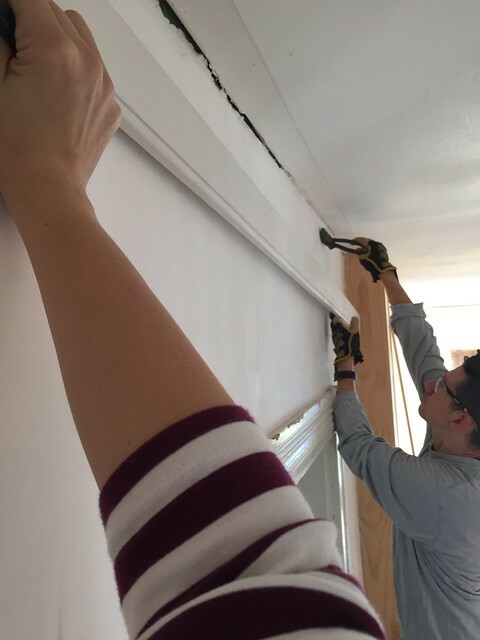 The backer can bend ever so slightly to accommodate minor changes in the ceiling, so once we had things supported in the right place we'd nail the rest. Then, once the backer was in place, we'd put up the crown piece. 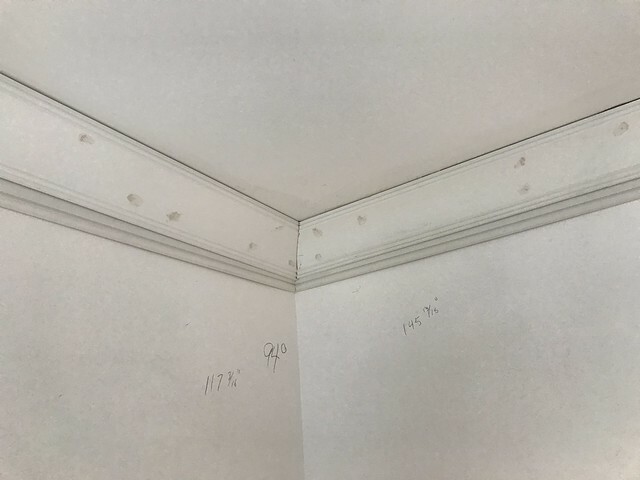 As you can see in the photo, there's a larger gap near the left corner where the moulding met the ceiling that we filled with a shim. That will close up when we caulk, but it's necessary to ensure consistent lines across the backer. 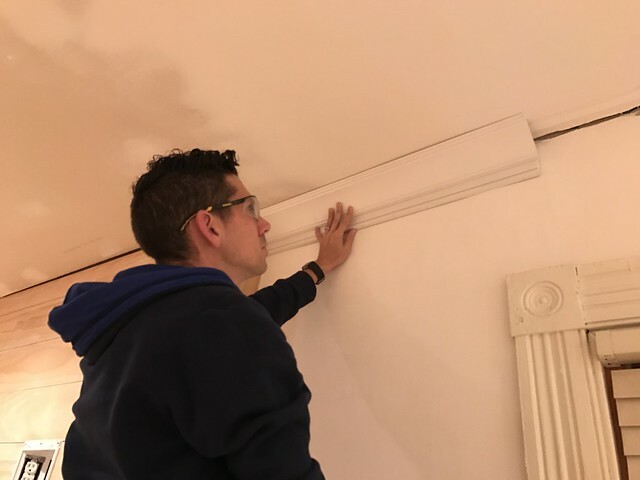 Had we forced the moulding up against the ceiling, we'd have a giant gap in the corner, and the moulding would sit too high in the corner and too low in the middle. Like a healthy marriage, installing crown in an old house is all about compromise, and it might sometimes result in an argument or few. With what we thought might (hopefully) be our only major marriage meltdown of this project behind us, we continued on our project. 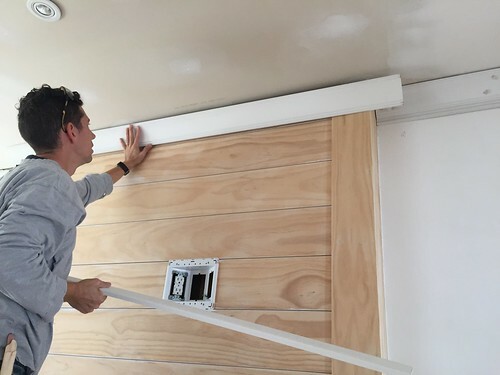 Next up we had to figure out how we wanted to handle the shiplap. 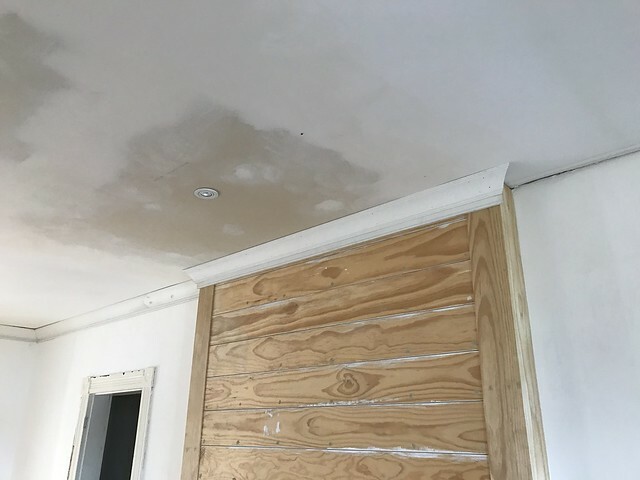 I had planned on not wrapping the backer around the shiplap bump out and just doing the cove. I held up a board so Wendy could get an idea of my plans. We did need to fill the gap behind the backer with a small piece of wood, but once everything was in place, it was really looking great. The next several pieces were tedious, but they went up pretty quickly. We were in a rhythm of putting up the backer piece first, then cutting and placing the next crown piece before moving onto the next backer. It was a much better approach and ensured a far more consistent outcome on each piece. As we worked our way around the room we came to the trickiest pieces, outside corners. My favorite way to deal with outside corners on crown is to cut two smaller pieces as templates. I can then mess around with the angles until I get it just right. Once the angle is just right I can then go cut the full sized pieces with those same angles and pop them up in place. This process adds a little time, but saves a TON of frustration and waste due to mis-cuts or mistakes. 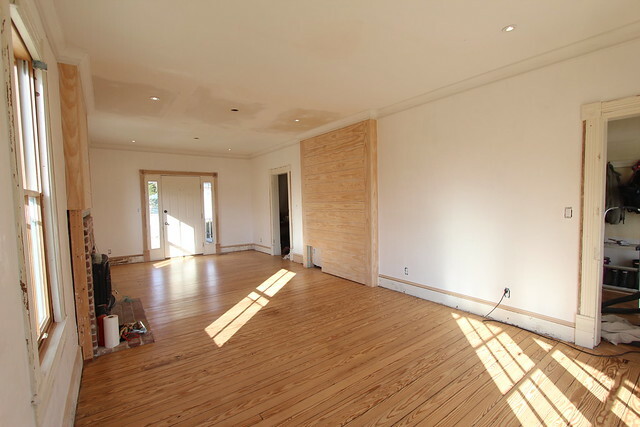 It's a little bit glaring with the change in color from white crown to natural wood, but once it's all painted the white trim color the angle will more or less disappear. 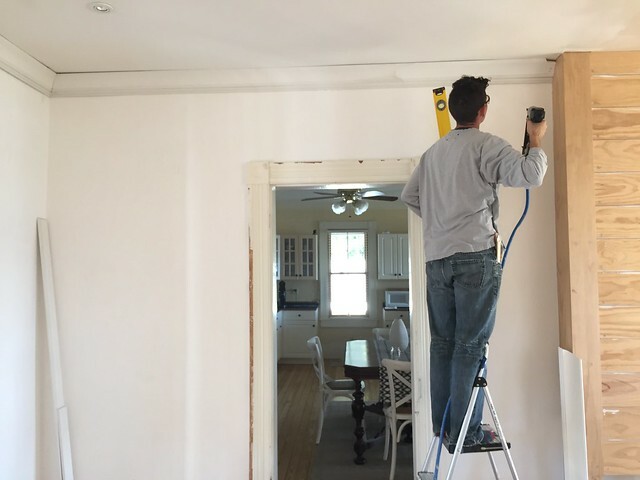 We spent roughly three full days hanging the moulding (stretched over the last two months or so) and a full day filling holes and sanding all of the wood filler in all of the trim around the room, and boy was there a TON of it! Once we felt everything was sanded, we moved onto caulk. 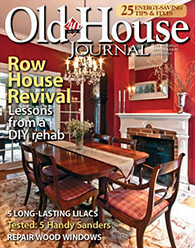 Caulking this whole room, from the baseboards to the crown to the shiplap, doors, and windows, took five full tubes of Big-Stretch Caulk. But I'll tell you one thing for sure, it really started to make the whole room look finished. Here's a photo of what it looked like on day one. Here it is in the middle of the worst and most destructive phase. And here it is with the moulding finished, walls and ceiling ready for paint! It felt amazing! After working in this room in its unfinished state for nearly two years, we are finally reaching a point where our vision has started to come together. All that is left is a whole lot of paint, hanging a fan and lighting, loading in furniture and decor, and building the fireplace mantle! Personally, I'm not sure I've ever been more excited to paint a room. 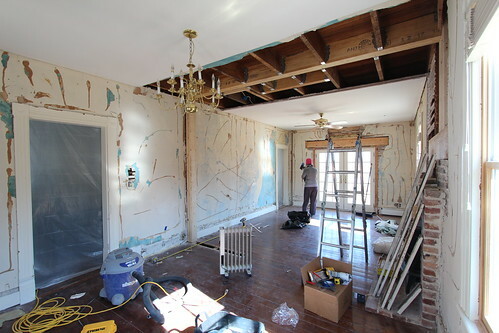 It's going to take a while, especially because we have to use oil based primer on the newly plastered walls. 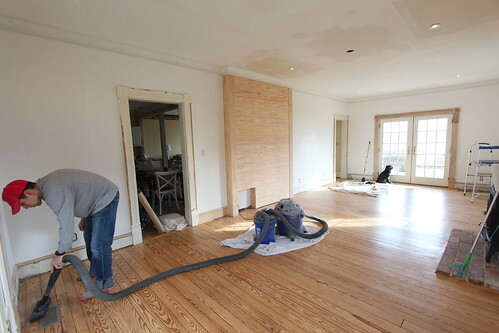 With our limited time at the house, we estimate it will take us four weekends to get the job done. Ugh. But we certainly see the very bright light at the end of the tunnel at this point. Have you ever tried your hand at hanging two part crown moulding? And if so, did it end up with you wanting to have nothing to do with your spouse? Now that it's behind us, we both certainly love the look of it. But even with a lot of experience hanging crown, it was far more difficult and far less forgiving than either of us originally expected. I think it's safe to say this isn't for the faint of heart, or the inexperienced DIYer. The best news, in spite of our minor moment of marital misadventure, we survived to tell the story. The main takeaway from this two-part crown experience is to plan your approach and work your way around the room rather than racing ahead. What a job! I have never hung two-part crown, but coincidentally, my contractor hung it in the kitchen last summer, and he would not speak to me for the rest of the day. LOL I did not even choose it, much less help hang it. Now I know. It's just a sh*t job. The crown is impressive, but not as much as figuring out how to make it work. And remaining spouses. No doubt this post will help a lot of future DIYers with crown molding, especially in old homes. The room looks so light and airy. Be proud. And I'm sure the 4 weekends of painting will go by fast (for me anyways). 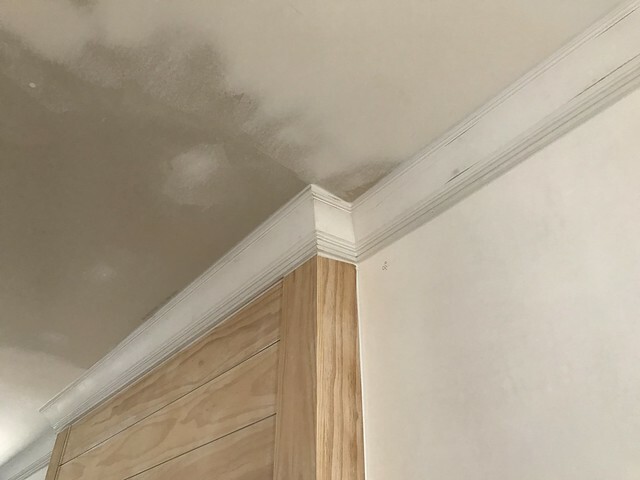 The molding looks amazing. Great job! My husband and I have done many DIY jobs, but never molding. 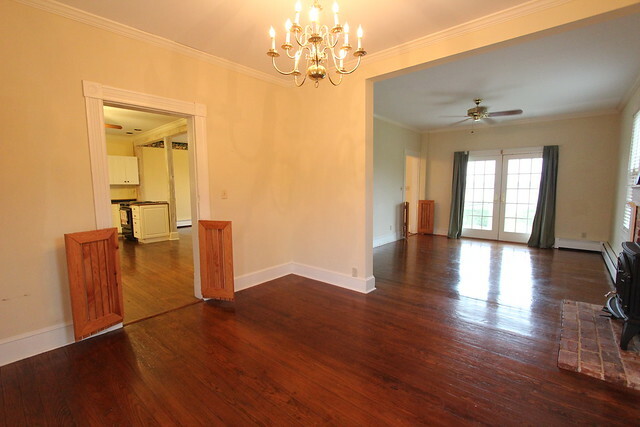 We do have two-part molding throughout our house, and it is beautiful. We had an experience much like your frustration and anger when replacing the siding over our bay window. It took us all day to put up three pieces of siding with all the measuring, cutting and remeasuring and recutting. It was a very long day. I truly appreciate your honesty. Even the best-communicating couples can experience a meltdown, and the complexity of your project perhaps warranted it more than most. One thing I love about blogs (versus 'professional' DIY sites) is that people like you tell the rest of us that our experiences aren't abnormal. That is SO important! Not incidentally, the crown looks great.